After posting the editor's impressions earlier today, we now have the thoughts from two other community members who got an early hands-on with PES 2013 at Konami last week. First up is Chris Towers; a 23-year-old from London who, after first talking to him on the PESFan forums a number of years ago, we have since become very good friends. We also hear from the OPE option file creator, Daymos, who pops in towards the end to share his impressions with you. The first thing we saw was the main menu screen, which was the PES 2013 teaser trailer running in the background - a real-life Cristiano Ronaldo, rather than a purely in-game version of the cover star. A small touch, but one I felt added a bit of slickness to the first menu we'll see upon turning the game on for the first time. Gamemode options were obviously restricted - I'm assuming what we had available to us will be what we'll see in the first demo - which will be released next month. We started things off by setting up an exhibition match; me against Mike. The pleasing thing about the match set-up screen is that all tweakable aspects of the match were in view - the strips, the full formations, the stadium, and so on. It all looked cleaner and more efficient than the match setting screens we've seen in past editions of the series. It's important to say that we didn't have a fair crack at playing the CPU - nor could we change the difficulty settings - so, we can only really write from the experience of having played against human opponents. The first thing we did was switch off all assistance settings - something that I never do on PES, so naturally, I had a nightmare with that. We gave it a go for half a match, failed miserably, then settled back for semi-assisted settings. From there, there were a few key aspects of the gameplay that stuck out for me. Firstly, the goalkeepers. When playing a lofted through pass down the wing for a forward to run on to, goalkeepers were by no means shy about coming out to meet the danger. The trouble is, they were remarkably casual about it. With the attacking forward steaming on at full speed, the keepers would trot out at their own pace, potentially landing themselves in hot water. Generally, they left enough time and set themselves very neatly to clear the ball up-field with their stronger foot. But after rushing forward to make a save, they weren't nearly eager enough to get back into position to prevent follow-up shots, which led to a few cheap goals. The scoring of lobs has been notoriously tricky in PES for a few years now, but it looks like they'll feature more prominently this year. They're a bit easier to handle - this may be a combination of an enhanced ability to execute them effectively and the over-casual keepers. I first attempted one after the keeper had saved a low shot. The ball came out to one of my players on the edge of the box, and first time, Mesut Özil rather comically lofted the ball about 30-foot in the air towards goal. It should never have been allowed in, but it dropped just under the crossbar. Fun to score, not so fun to concede, I think. I found the process of 'playing out from the back' quite difficult. It may have just been me, though. I love a good, passing approach to play on PES and by all means, you're able to do this - PES is the best in the business for it. But maybe, the opposition forwards and midfielders are a bit smarter and faster in closing you down high up the pitch and keeping the pressure on. Part of the fun and challenge I found was picking the right passes to make your way out to your midfield quickly, and counter-attacking at pace. All pressure and positional settings are changeable, of course, and we were playing against each other - we'll see how the flow of the games shape up against the CPU in time! Player ID looks very impressive, even at its most subtle, like the characteristic way that Cristiano Ronaldo runs with the ball. It is noticable as you play. But what has also been introduced is a series of ways in which to receive the ball and take deft touches. You can instantly carry a ball into space to keep the flow of an attack going, rather than controlling it first and going from there. I had a lot of fun with pressing R3, to poke the ball into the air on the first touch. With this, you can set your player up in terms of body position for a more effective shot or pass. Manual shooting offers a whole new element to PES gameplay, and we were urged to give it a go. In fact, so passionately did Jon Murphy and marketing producer Mano speak about the manual controls, that I wondered whether we will reach a PES release in the future where every aspect of gameplay is manual. This remains unclear - but Mano told us that he does want to venture even further into manual controls in the future. As for PES 2013, with manual shooting you can opt to curl shots high into the net (I scored a beaut late on in the playtest), or to drill them low: the kind of powerful, placed, daisy-cutting finish that's so aesthetically pleasing in real life. To do this, you press L2 and triangle. Previously, all shooting has been with square, so being aware that you can press triangle to shoot (not just to play through balls) is something that you'll need to get your head round. Aiming is something that felt devilishly difficult at first, but I think it will all come more naturally with a good spot of practice. One thing that you can say for the PES series in recent years is that it mimics the real-life game in the way that you can score from anywhere on the pitch, and with a terrific variety of techniques. Here, I mean different kinds of headers, volleys, flicks, and the motions your player makes when striking the ball. However, with the combo of Player AI, the new dribbling touches I've mentioned, and manual shooting, that variety in goalscoring will be pushed even further in PES 2013. Receiving a ball into feet, flicking it up over the sliding challenge of an opponent and rifling a volley into the bottom corner is something that now seems one of any number of potential, wholly possible, options. To round off, perhaps I can draw a little upon another gaming event. I went to a FIFA 13 media playtest a few weeks ago and - quite impressively - four months before its release date, we were able to have a crack at the new FIFA and it was remarkably polished. Minor tweaks will still be made and certain gameplay issues are undergoing their final stages of development, but it felt very close to a code worthy of boxing up and sticking on shop shelves. With this playtest of Pro Evo, I didn't get that impression. I got the personal feeling there's still a little further to go in terms of ironing out the game. Which is okay though! PES is usually released around a month after FIFA, and production schedules will vary between EA and Konami. It was, in every sense, a playtest. However, PES 2013 is not yet complete, and what will hit the retailers come October will be a game that what I saw last week. I entered Konami's main boardroom and there were six 32-inch TVs positioned around a large oval table with one massive 70-inch TV hanging on the wall at the head of the table. We all took our seats, and to my delight, I managed to land the Xbox 360 code. All the community members were there from various websites and it was nice to get acquainted with the people I speak to online every week but I have never actually met in real life. Jon Murphy - who shook my hand as he entered the room - entered the room, along with Ippei Nio and Manorito Hosoda, who had both flown in direct from Konami Japan. 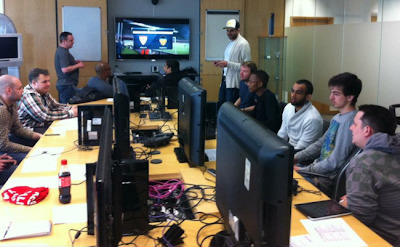 They all gave their presentations and after that, we were finally given the go-ahead to try out PES 2013. The main core of the game looked the same as PES 2012, which didn't shock me because, like all of you I'm sure, I've seen in-game footage already. I didn't go deep into the formations, only moving out players who were on blue and purple arrows. My pass assistance was on 1-bar and I also turned off all CPU assistance (auto slide, etc). I also had the player cursor switch to semi-assisted. There was 2 sheets of A4 paper placed in-front of each TV with the full control list, including instructions on how to perform all the new special moves. A lot of the moves were exactly what we've been used to in past games. The new control list was a lot to take in, however, the sheet was always in-front of me so I could always remind myself of the required commands if I needed to. Beginning the first match, I kicked off and with each pass I would practice a new move. I tested out the new trapping moves, as well as the Dynamic First Touch. Later on in the afternoon, I tried to smash a powerful pass to see if my player would still be able to get the ball under control, but unfortunately, whenever I tried this, my passes never went direct to my players' feet. However, normal passes were trapped well so it may just be a steep learning curve for me. Dynamic First Touch is perfect when you're being closed down and you need to give yourself a few extra yards to enable you to get out of trouble, or - if you're feeling adventurous - if you want to take a shot on. I was pleasantly surprised with Deft Touch Dribbling and how it was not only instinctive to use, but it was very effective when used. As I got to grips with it, the new dribbling skills were fun very to use. It worked great because you could move in any direction whilst controlling the ball (by rolling it with the sole of your foot), and with that, you had the option to weave around players, with or without skills, depending on situation. I soon found myself weaving in and out of players in tight spaces - sometimes successful and sometimes not. Either way, it was refreshing to use. Jon Murphy said that it may be overpowered slightly, so more work may be done in-time for the game's final release. I found manual passing quite responsive; small and long passes felt satisfying, although the power of some passes were hard to calculate at times. I won my first match 3 -1. Despite scoring an impressive three goals in my first-ever game of PES 2013, I was unable to get a manual shot on-target. Right now, it's definitely something that will take time to learn. After playing my second match, suddenly, it hit me that I hadn't tried out all the new moves yet. So I checked the control sheet once more and started to set up another game. In this match, I wanted to received the ball mid-height so I could try to flick it ahead of my path and allow myself to attempt a volley on goal. However, it seemed that every ball I was receiving during this match were either head-height or rolling along the ground. But then, I got the perfect ball and managed to pull it off. I wasn't far from the semi-circle line, and although I was far away from goal, I just had to shoot. I wanted to see how good the animation sequence looked. To my delight (again), my shot was a prime example of how the shooting has - finally - been fixed. We played a few more games tweaking the passing assistance to zero-bar so each game became an opportunity for me to try and execute some of the new moves, while also playing beautiful football. Passing was all about judging the power bar correctly. The ball physics were improved too and it all just felt right. The game does still look like PES 2012, but the new moves makes the way you play football so much more fun and in-depth. In past FIFA games, when dribbling, you always know if you're going to get tackled. If you get close enough to a player, you know your opponent (not that he has to even press anything), will steal the ball from you. It's boring, unpredictable and makes the game repetitive. I didn't get this feeling with PES 2013; you have so much more freedom and you really thought: "anything goes" in this game. I loved it. I didn't succeed with manual and finesse shooting because when running towards goal, in the heat of the moment, you seem to forget all the controls and you end up just shooting normally. Lobs still need work. The ball just goes straight up in the air and the trajectory doesn't look good, however, I'm confident it will be fixed for the next build. Tackling was improved. The balance was good and the new double-tap and lunge in system works very well. When I did foul, the referee would wait patiently to see if there was any advantage - I have to say that the referees' decisions were smarter and more realistic compared to previous versions of PES. I found corners and free kicks to be more realistic; in terms of their outcomes (scoring ratios for example). Halfway through the playtest, I got the chance to interview the PES team. I asked if there was a possibility on whether we could create hundreds of leagues in PES. Mano explained to me that there's some sort of size limit that Konami have to work with - whether it's there to allow the game to function properly, or if it's regarding agreements with Microsoft, or Sony, I'm not exactly sure. I mentioned that PES 2012 has 70 editable (unlicensed) teams but only 51 emblems spaces. Logically, I asked them to give us 70 emblem slots so we can equal up the numbers in PES 2013. They seemed to like this idea. I pleaded with them... and while they chuckled between themselves, the two wrote down some notes. So, if we do get 70 emblem slots this year, I will claim the glory...... but then I will also regret not asking for 100 slots! After the playtest, me and Mike (OPE Founder) went to a local bar to watch the Euro Championships. While watching Portugal beat Denmark, I then appreciated how realistic the AI was in PES 2013 is; the way the ball gets moved around the pitch was so realistic in the playtest. I was seeing players do things in a real-life match that I could never do in PES... until now. A few days after the playtest, I decided to load up PES 2012, and I was in for a shock. The gamespeed was so fast and unrealistic compared to PES 2013. Don't get me wrong, PES 2012 has been a great game for me this year, but I suppose this is always going to happen when you go back and play the previous instalment of a football game - of any game for that matter. People often ask me whether I think this game will beat FIFA. Right now, I don't know. However, I do believe that PES players will appreciate how the game has gone back to its old school roots - and in a more modern and up-to-date way. My personal opinion is; to pull people away from FIFA, Konami need to either put the game in people hands early - and with next month's demo, they will certainly do that. On a final note, I would like to give my thanks to Konami for allowing me to be part of such an exclusive event, and for also making me feel so welcome on the day. If you have any questions on PES 2013 that have yet to be answered, please send them here in our PES 2013: OPE Q&A thread.